KayakVagabond » Blog Archive » Random Animal? Following is a bit of a teaser, along with a video, photo album, and some of my initial impressions. Please check back soon for a detailed write-up of each day, as I’m off to teach at the Pagaia Symposium in Spain later this week. “Highest” Moment: Paddling the Everglades coast at night, the reassurance of small campfires burning on a few remote islands, under an undiminished sky free from city lights. The milky way was a glowing ribbon overhead and the Southern Cross graced the horizon. I navigated by following the stars, assisted by the GPS. The night was so beautiful that I shook off the need for sleep and paddled through the night. I was rewarded with experiencing the moonrise, and later the sunrise from the water. Carter Johnson (endurance kayaker) said that one of the reasons that he loves an event like this is that it shoves you out of your comfortable routine, and puts you into fantastic and unusual situations. I cannot agree more. “Lowest” Moment: On day 2 I was charging on the outside (Gulf) near Naples, heading for Marco Island. The waves were lumpy but not unpleasant as darkness fell. Suddenly the wind came up, a strong on-shore breeze blowing at 20-30mph with stronger gusts. Soon the tops of the waves were blown-off by the wind, and the surf was overhead; it was no longer safe to continue. Throwing braces at night, in a loaded kayak, when you can’t see, isn’t much fun at all. Going further offshore didn’t help, my only option was a surf landing. I retracted the rudder, picked the best spot for a stealth camp, and headed in. The waves were steep and overhead, so I rode in sideways (bongo slide), while high-bracing into the face of the breakers. Upon leaping out, the next wave filled the cockpit with water and sand. I portaged the gear and the kayak into the mangroves, cleaned up my kayak, and found a micro-site not much larger than my outstretched arms to setup my Hubba tent. It was snug and comfortable, and protected from the cold roar of the wind, but my paddling day was cut seriously short — I had intended to paddle well past midnight. Best Wildlife Moment: I had to go far offshore at Wiggins Pass due to the large rollers that were streaming into the inlet. Just past the turbulence, a dolphin’s fin surfaced only yards away from me, and then the dolphin launched into a full Marineland style somersault — completely clearing the water!!! Most Surreal Moment: The final leg to Florida bay is only 35 miles, but some Watertribers will tell you that once you reach it, you are really only at the halfway point. The shallow water is fraught with serpentine channels that are tricky to navigate and the temperamental bay kicks up into a wild, steep chop. During my night crossing the wind completely died. All sensory input was lost. With the water so still, and with my vision focused on a beacon miles away, there was no sense of forward motion. It felt like I was on my kayak machine at home, motionless. At times it even felt like I was moving backwards. Many thanks to Watertribe, the organizers and the race/checkpoint captains! Watertribers themselves are a colorful, eclectic bunch, with some of the most tenacious, cunning and generous competitors that I have ever had the pleasure to meet. If a Watertribe event is on your bucket list, I urge you to give it a go. As “Chief” says, just getting to the starting line is a victory in itself. 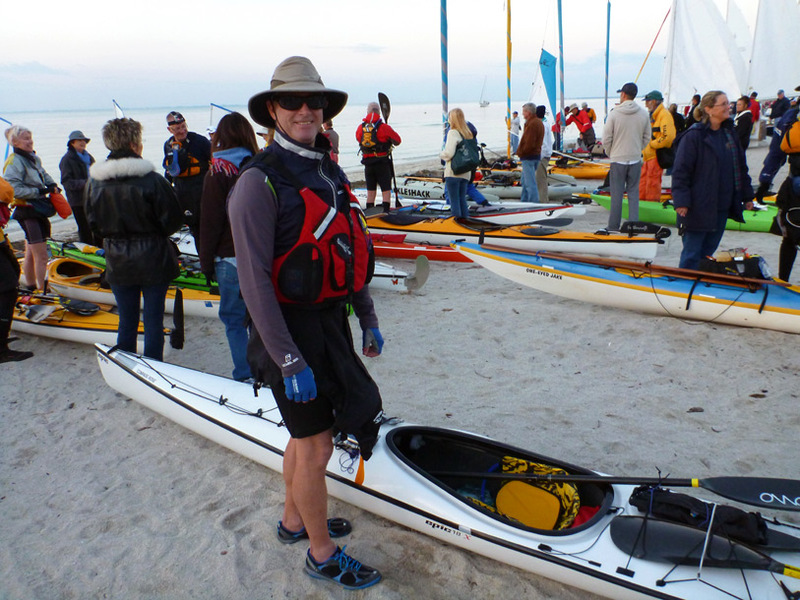 Please view my Everglades Challenge Gallery Images. It was a real pleasure meeting you Greg. On Florida Bay that night, we too experienced the surreal loss of sensory input that you describe. During those few hours in the darkness, with no wind, and with no fixed reference to gauge movement; it seemed as though I was on the brink of madness. I was very lucky to have TheJuice piloting our boat. Bob, great meeting you as well! You and the TheJuice ran a ballsy and aggressive race, congratulations on a job well done. I look forward to crossing paths again soon. Hey Greg, my race report here; http://www.kayaklakemead.com/everglades-challenge.html. Bob, that’s a great write-up — especially your description of side-surfing at night. Losing a headlamp is no fun, but your imagery of watching it spiraling below you into the darkness, still lit, is quite powerful. As you know, dealing with breaking waves in the darkness is a completely different animal than during the day, as your sensory input is limited and your mind and imagination can go into overdrive. At times like that a partner in your tandem must be nice to have! Your description of the capsize is a good read. I find that sometimes a good preemptive (practice) roll does wonders to restore confidence when you start to fear that the conditions are playing you (instead of the other way around), and when trying to decide if it’s really time to stop (if that is even an option). Thanks for sharing. Thank you for your comments. What a great idea for establishing confidence in the time of need; a preemptive roll. We did one on Thursday out in Tampa Bay before the race for whatever small amount of good that did, but one practice roll just as conditions were changing would have been perfect to get us in the right groove. I’ve sailed the Caribbean seaervl times during hurricane season. Never had any problems, but you do take your chances going in late summer or fall. We got two free days on one cruise because we had to kill time waiting for a hurricane to pass so we could come into Ft. Lauderdale. You wouldn’t even have known there was a hurricane while we were at sea, although coming into port in FLL was rather rough.The cruiselines have sophisticated weather information and can very well avoid any storms. You may miss a port because of a storm, or be delayed, etc. You may even get some high seas and rain.For lots of great info on cruising, go to CruiseCritic.com, click on Boards . You may be particularly interested in Carnival Cruise Lines , Ports of Call , First Time Cruisers and East Coast Departures , among many more.My tips: Don’t use cruise line air or ground transfers you can do better independently. Fly into Miami the day before your cruise, just so you have plenty of time in case there are delays.Have a great cruise.